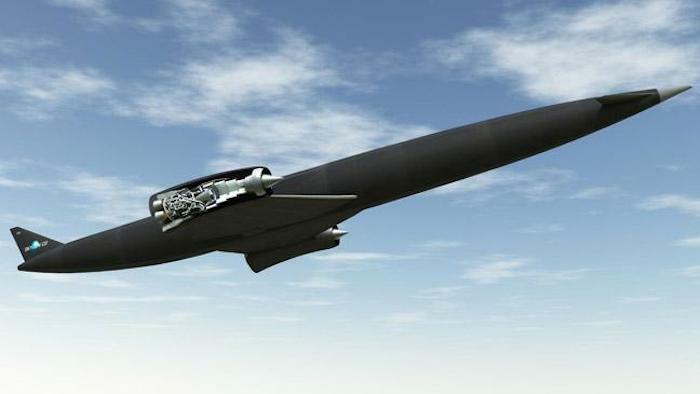 Development of the Skylon spaceplane has passed a critical milestone following tests on the key component for its SABRE engine. The engine, being developed by Reaction Engines Ltd, looks set to revolutionise not only space travel but also air transport around the world. It promises to allow a new generation of aircraft to fly from one side of the Earth to the other, e.g. the UK to Australia, in just four hours instead of the 22 or so needed nowadays. But it will also provide sufficient boost to send the Skylon spaceplane into orbit where it could deliver satellites or link up with the International Space Station. What makes SABRE different from other aircraft engines is a revolutionary ability to switch from an air-breathing mode to that of a rocket engine. This hybrid function will allow it to power aircraft at up to five times the speed of sound within the atmosphere or directly into Earth orbit at 25 times the speed of sound. Critical to the operation of this new engine is the ability to cool continuously the incoming airstream from over 1,000⁰C to minus 150⁰C in less than 1/100th of a second. That effectively doubles the current technical limits of jet engine speeds. 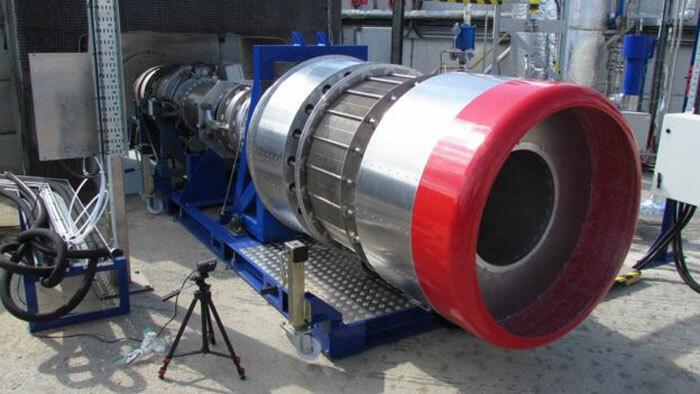 The tests, undertaken at Reaction Engines’ facility in Oxfordshire, integrated the ground-breaking flight-weight pre-cooler technology with a jet engine and a novel helium cooling loop, demonstrating the crucial new technologies in the SABRE engine. 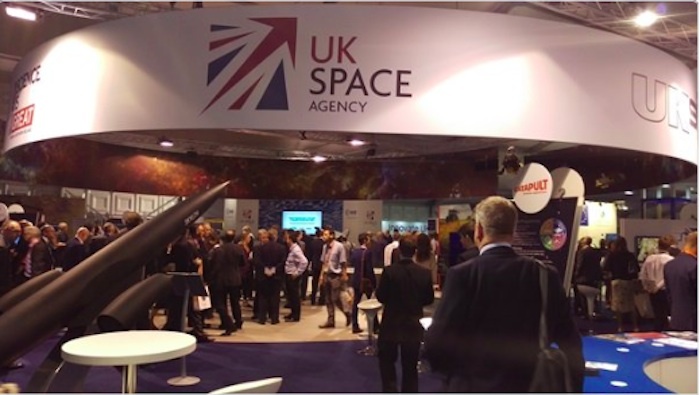 UK Science Minister David Willetts recognised the importance of Skylon development yesterday when he visited the Farnborough Airshow and spoke about the UK's future in space. He said: "The engine being developed by Reaction Engines is a potential game-changer in terms of space technology. This successful testing validates the assessment made of the engine concept by the UK Space Agency back in 2010 and is yet another example of the UK’s world class space industry. It would be a fantastic achievement if we could one day use this home-grown technology for our own commercial space launches." Mr Willetts said he felt Europe was not ready to grab the opportunity offered by Skylon. He said: "We must formulate a regulatory framework that will allow reusable aircraft-type launchers to operate here. Their SABRE engine already represents 30 years of incredible British R&D. It’s a remarkable world first, and the pace at which they're advancing illustrates the urgency of laying the appropriate groundwork now. In the UK’s Oxfordshire country-side, the legacy of British invention is being passed from Sir Frank Whittle to a new group of dedicated aerospace engineers and one man in particular; Alan Bond. The long held dream of UK spaceflight is coming closer to reality, and his dream could be a game-changer. Despite decades of lacklustre political interest Reaction Engines Limited (REL) is working on a revolutionary engine that could herald a new era of space travel. Historically the UK, while being rich in inventing talent, has increasingly suffered from a decline in “big growth” industries. This was especially true due to the costly rebuilding efforts after the Second World War when successive government investment and appetite for fiscally supported industrial and sector wide initiatives has waned. Against this stark backdrop, lifelong inventors, like Bond, have toiled away on meagre funds dedicated to their concepts, holistic thinking and often encountering obstacles along the way. However this landscape could change soon. Alan Bond and REL are behind Skylon; the successor to Britain’s aborted HOTOL space-plane concept of the late 1980s. It is an unpiloted fully reusable aircraft-like vehicle capable of transporting 15 tonnes of cargo into space and is intended as a replacement for expensive expendable launchers in the commercial market. Skylon aims to be the first single stage to orbit (SSTO) vehicle in the world, addressing the needs of all major space launch markets (telecoms payloads, multiple small satellites, personnel, cargo, space station supplies and orbital infrastructure embedding). The Skylon vehicle consists of a slender fuselage containing propellant tankage and a payload bay, with delta wings attached midway along the fuselage carrying the SABRE (Synergetic Air Breathing Rocket Engine) engines in axisymmetric nacelles on the wingtips. Within these SABRE engines lies a unique technology developed by Bond and so far untapped by the wider aerospace and space industry. Inspired by the adventures of British Astronaut pilot Dan Dare in the Eagle comics of the 1960s, Bond’s inspiration for manned spaceflight began at an early age. As a teenager, Bond built rockets in his back garden shed but began to challenge conventional thinking in launch technology. Since Sputnik 1 in 1957, all spacecraft and satellites have been placed into orbit by expendable multi-stage rockets. Like many in the aerospace community, Bond believes that these have a fundamental design flaw. Whether a launch vehicle is powered by solid or liquid propellant, a large proportion of a vehicle’s launch mass is taken up by its oxidiser that is required for combustion to take place. The irony is that for much of its launch the vehicle is passing through all the oxygen it needs in the Earth’s atmosphere. As conventional rockets have been developed with long lead times and high cost for single use, there is no learning curve or opportunity for error and cost reduction in any one vehicle. Consequently, Bond believes that there is no value for money from re-use of these vehicles. The key to reliable, responsive and cost effective access to space lies in a different aircraft / spacecraft configuration. Alan Bond’s persistent challenge to this conventional thinking is perhaps analogous to another visionary engineer, John Houboult without whom reaching the Moon during the 1960s would perhaps not have been possible. 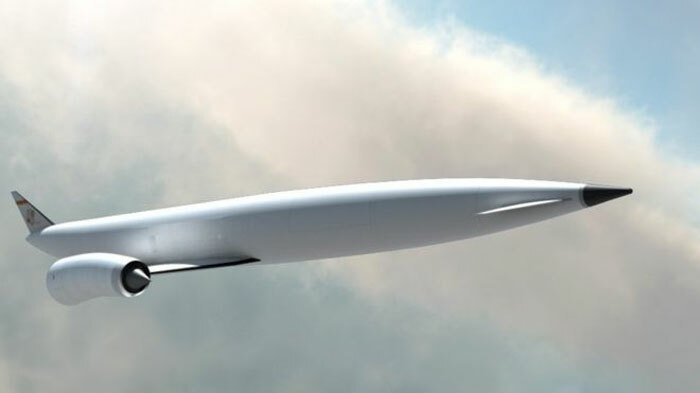 Bond conceived a hybrid jet and rocket engine design that uses a unique air breathing rocket engine which can potentially revolutionise how future launch vehicles can reach orbit. Finessing and progressively developing this design concept over 30 years, he and his engineering team have incorporated this concept into the SABRE engine which is integral to the Skylon design. In the 1970s during his tenure at Rolls Royce, Alan Bond began actively pursuing the holy grail of launch technology; an SSTO launch vehicle. As conventional space faring rockets have to have variations in design using three propellants (Liquid Oxygen, Liquid Hydrogen and Kerosene) and multiple largely unrecyclable stages, he believed that this design was not fit for purpose. By 1982 he was already investigating methods for getting the oxidiser from the atmosphere, much like modern jet aircraft. By not cooling the air to liquid but cooling the gas and work needed to compress it, with a clever use of thermodynamics Bond had discovered a concept that formed the basis of the engines for HOTOL (Horizontal Take Off and Landing), Skylon’s forerunner. During the 1980’s Bond teamed up with Bob Parkinson (British Aerospace) and John Scott-Scott (Rolls Royce) to lead Project HOTOL securing funding from the UK Government, British Aerospace and Rolls Royce. Feasibly the concept was sound but the practicalities of incorporating the revolutionary engine concept into a flawed airframe design led to the project falling short of its ambitions. Bond’s team had also discovered a method to remove super-heated air entering HOTOL’s engines but were continually derailed by frosting and ice build-up as a result of their engine cooling efforts. HOTOL was seen as a failure by many within Margaret Thatcher’s Conservative Government at the time; an expensively flawed and commercially non-viable space-plane compared to the US’s Space Shuttle. It was also Britain’s last chance to join the club of spacefaring nations. As the project came to an end, Kenneth Clarke who was then Trade and Industry Secretary in Thatcher’s government pulled the plug and withdrew support. And so began the UK’s shift to being a space consumer and minor ESA partner, rather than leading the way and being a space developer of launch technologies. Any giant engineering leaps of ambition were it seemed an act of folly for the UK government and British investors, yet the dream stayed alive with true believers like Bond. With no home government investment and sponsors Bond patented his engine designs and his team tried to approach more favourable European partners but they were quickly bound by the UK Government’s Official Secrets Act. HOTOL was off limits as proprietary UK technology could not be shared or developed with foreign firms, nations or even other UK based firms. This was a short sighted nationalistic and militaristic manoeuvre halting development momentum and has been echoed years later by the ITAR issues that have stymied the US Commercial Space Sector. Britain had closed the door on any active role in developing space vehicles and with it, independent access to space. Despite these setbacks, Bond retreated to reform his concepts with a new team. Saving the best lessons learned from the HOTOL Project, in 1989 Bond formed Reaction Engines Limited with John Scott-Scott and Richard Varvill also from Rolls Royce. As a small research company on a shoestring budget, computer simulations and models were the only way they could test their theories for a very long time. During the next twenty years the trio further refined the HOTOL concept and airframe, shifting the centre of mass to create a more stable flight design. All this was done bypassing the UK Government’s Official Secrets Act and Bond’s own patents with more nuanced offshoot aerospace discoveries- and also without a penny of government funding. Bond also pioneered the new use of compact, lightweight heat exchangers within the rocket engine cycles which greatly increased their efficiency by allowing the engines to use atmospheric air to burn in the combustion chambers like conventional jet aircraft, rather than using heavy liquid oxygen stored in on-board tanks, during the portion of launch within the atmosphere. Given the high Mach speeds that the final vehicle would need to reach gravitational escape velocities, the patented heat exchanger technology enabled heat extraction from the engines at super-hot temperatures that would otherwise melt the metal alloys in the engine. This enabled the high (Mach) speed air coming into the engines to be cooled from 1000 degrees Celsius to minus 150 degrees Celsius in a microsecond. It also successfully bypassed the ice build-up problem that derailed HOTOL (via a new patented frost control system) in the process. 400 megawatts of heat could be transferred from the air before intake into the engines. This approach also enabled SABRE-powered vehicles to save carrying over 250 tons of on-board oxidant on their way to orbit, and removed the necessity for massive throw-away first stages that are jettisoned once the oxidant they contain has been used up, allowing the development of the first fully re-usable space access vehicles, such as Skylon. The heat exchangers are proprietary technology unique to REL and to date no other aviation or space company has anything like it in development. Like the miniaturisation of the microchip, Bond determined that size, weight and high powered effectiveness of this key component would be the foundation of the entire project. The lightweight heat exchangers he has designed can be incorporated into REL’s new SABRE engine to power modified aircraft directly to Earth orbit and propel aircraft at Mach 5 cruise speeds. The heat exchangers are reportedly 100 times lighter than any current technology and have pre-cooler tube walls only 27 microns thick but capable of withstanding pressures greater than 150 bars of atmospheric pressure at extreme temperatures. As with all launch vehicles, weight and material tolerances to extreme environmental variables are crucial factors and the lightweight heat exchangers appear to solve these critical problems. 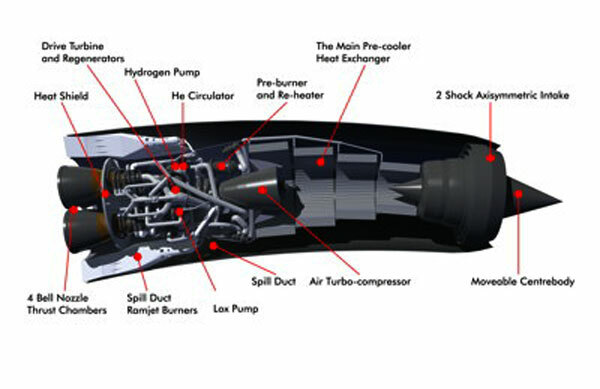 During 1989-2000 work focused on the development of the SABRE engine and the final Skylon launch vehicle. Innovations in aerothermodynamics, propulsion and control technology attracted a great amount of interest, private investment and finally government support. The innovative carbon fibre reinforced plastic fuselage for Skylon provides a strong yet lightweight airframe, surrounded by a single skin of material, a ceramic external aeroshell. This is corrugated for stiffness and thermal compliance on the substructure upon which it is mounted. A thorough research programme followed, demonstrating the techniques for full scale heat exchangers and the manufacturing techniques to build these components. The UK government and the UK Space Agency had removed themselves from the launch technology game following the Thatcher government’s notional withdrawal from UK space efforts in the 1980s. However in early 2012, buoyed by ESA’s recommendations, Bond and REL began testing the first full scale SABRE pre cooler with a jet engine to test heat exchanger performance in a working environment. This demonstration pre-cooler included over 50 kilometres of heat exchanger tubing weighing less than 50 kilogrammes and dropped the air temperature to minus 150 degrees Celsius in 20 milliseconds. 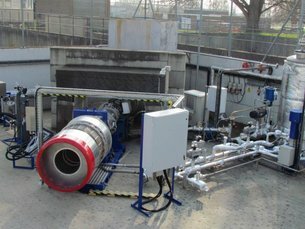 In November 2012 REL announced successful completion of the SABRE engine tests with its pre-cooler heat exchanger and ESA gave its official validation of the results which was backed up by the UK Minister for Universities and Science David Willetts. “These successful tests represent a fundamental breakthrough in propulsion technology. 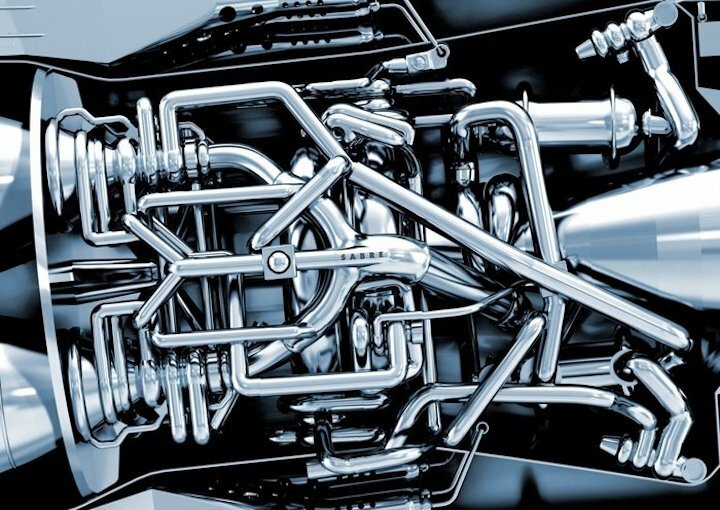 Reaction Engines’ lightweight heat exchangers are going to force a radical re-think of the design of the underlying thermodynamic cycles of aerospace engines. These new cycles will open up completely different operational characteristics such as high Mach cruise and low cost, re-usable space access, as the European Space Agency’s validation of Reaction Engines’ SABRE engine has confirmed. In July 2013 the UK Coalition government announced its intention to invest £60 million ($90 million) into the full development of the SABRE engine, creating 21,000 jobs in the UK aerospace and space sectors. This will maximise the UK’s access into the high growth £13.8 billion ($20.7 billion) launcher market over the next 30 years with all the associated economic benefits rippling out from this investment. The initial £60 million will prime the pump for the remainder of the investment capital needed to fully develop the SABRE engine and will be divested over 2013-16 to REL. The SABRE development programme itself is expected to last from 3-5 years. A prototype SABRE engine is expected in 2017 with flight tests around 2020. In August 2013 ESA funded a £0.9 million ($1.35 million) study, by a consortium of companies to establish a business case for Skylon’s operation in the satellite launcher market from 2020 onwards. In November 2013 Bond himself announced that the upcoming development phase of Skylon will be expanded from £240 million ($360 million) to £360 million ($540 million), and will now include the construction of a full-scale working version of SABRE. 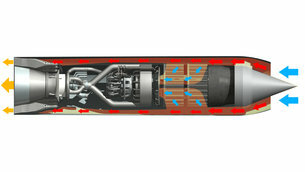 The potential game-changing characteristics of Bond’s SABRE engine have finally been recognised. REL estimates it would cost around £8 billion ($12 billion) to develop Skylon itself. That is comparable to the development costs of the Airbus A380 or the Ariane 5 manufactured by Astrium. Initial Skylon launches would cost about £23 million ($35 million) but that could fall by as much as £7 million ($10 million) as more Skylons are brought onto market. It seems that confidence in the capacity for British engineering has grown again. Since the cancellation of HOTOL in the late 1980’s, the same technology has been refined and re-accepted by the current UK government. Simultaneously, while the demand for satellite launches has increased, the high cost and unreliability of conventional rocket launches has not improved by the same pace. The world is ready for something new and timing is everything. As for Alan Bond, this decades long odyssey to develop an enabling technology and a viable spacecraft for economic and reliable access to space has become a very personal journey. He has spent many years working in the wilderness due to lack of governmental foresight and support but, like all great engineering visionaries has stayed dedicated to his idea and doing whatever it takes to realise that idea. With a wider overview away from Skylon, Bond believes in a greater journey for humanity with longer strides beyond the Moon with more advanced propulsion. Skylon is a way to take those first steps. “What is absolutely clear to me is that the human race and its petty squabbles are confined to one piece of debris near a fairly ordinary star. Bond’s history with the development of SABRE and Skylon echoes that of Sir Frank Whittle, inventor of the turbojet engine. Whittle himself demonstrated an early aptitude for engineering and also without the UK Air Ministry’s support in his time, formed a company with limited funds to develop the first prototype jet engine. The Jet Age began shortly after and made the world the much more interconnected place we live in today. Considered in a BBC poll as one of the 100 Greatest Britons, Whittle’s legacy remains intact today. Bond is on the way to echoing Whittle’s success and creating his own legacy with the advent of a new age in spaceflight. His is a story of overcoming adversity, skepticism, winning over governmental intransigence and defeating the Official Secrets Act, to realise his ambitions. It appears today that he is on the threshold of his personal dream, to reach Earth orbit in a single giant leap. Reaction Engines has passed the first development milestone for a hybrid rocket engine designed to power its single-stage-to-orbit Skylon spacecraft. Passing the preliminary requirements review has kept the programme on track to launch a demonstration of a full-scale Sabre test engine before 2020, Reaction Engines says. The UK-based start-up calls Sabre potentially the “greatest advance in propulsion since the jet engine”. Unlike two-stage-to-orbit designs, the Skylon is designed to take-off from a runway and launch into space without a booster stage. At high altitudes, the air-breathing engine uses a pre-cooler system to dramatically raise the pressure ratio of oxygen entering the ramjet inlet. This cooled, compressed air is then mixed with liquid fuel and combusted in a rocket engine. The latest review of the full-scale engine comes about three years after Reaction Engines completed a series of component-level tests. The Skylon development project began nearly six years ago, after Reaction Engines received a development contract from the European Space Agency. Reaction Engines is recruiting workers and buying special equipment to begin building Sabre pre-coolers in-house and to prepare for full-scale rig tests in 2019. The existing design staff have relocated to larger offices at the Culham Science Centre near Oxford, while two manufacturing units have been consolidated in nearby Didcot. The UK government has committed £60 million ($91 million) to the project, which is supplemented by an undisclosed amount of private capital. Reaction Engines' design concept for a space launch vehicle. BAE Systems has bought a 20% stake in a company developing a radical engine that could propel aircraft into space. BAE is paying £20.6m for the stake in Reaction Engines, which is developing a hybrid rocket/jet engine called Sabre. Reaction says the technology would allow the launch of satellites into space at a fraction of the current cost and allow passengers to fly anywhere in the world in four hours. The British government is also investing £60m in the company. It is based at the Culham Science Centre near Abingdon in Oxfordshire. The firm hopes to have a ground-based test engine working by the end of this decade and begin unmanned test flights by 2025. According to Reaction, an aircraft using such engines could take off from a runway and accelerate to more than five times the speed of sound, before switching to a rocket mode which would propel the aircraft into orbit. Reaction has designs for such a plane, which it calls Skylon. "Today's announcement represents an important landmark in the transition of Reaction Engines from a company that has been focused on the research and testing of enabling technologies for the Sabre engine to one that is now focused on the development and testing of the world's first Sabre engine," said Mark Thomas, managing director of Reaction Engines. One of the challenges for the engineers at Reaction is to manage the very hot air entering the engine at high speed. These gases have to be cooled prior to being compressed and burnt with onboard hydrogen. Reaction engineers have developed a module containing arrays of extremely fine piping that can extract the heat and plunge the inrushing air to about -140C in just 1/100th of a second. It's new technology such as this that Reaction and BAE believe could put them ahead of the competition. Nigel Whitehead, group managing director of programmes and support at BAE Systems, said: "Reaction Engines is a highly innovative UK company and our collaboration gives BAE Systems a strategic interest in a breakthrough air and space technology with significant future potential." Competition has been growing in the market to launch satellites into space. SpaceX, backed by billionaire Elon Musk, is using conventional rockets to carry satellites into space as well as ferrying supplies to the International Space Station. Blue Origin, which is financed by Amazon founder Jeff Bezos, is working on a fully reusable space vehicle. Meanwhile Richard Branson's Virgin Galactic has developed its own launch system which involves a plane carrying a rocket to high altitude. The revolutionary project has been given an £8 million funding boost from the European Space Agency. A revolutionary British space plane engine that could turn science fiction into fact may be test fired in just four years following an £8 million boost from the European Space Agency (Esa). The new commitment to the Sabre project was announced at the Farnborough International Air Show. 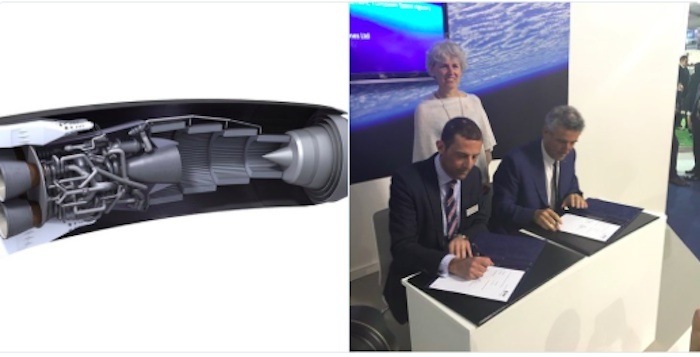 Sabre (Synergistic Air-Breathing Rocket Engine) is being developed by Reaction Engines Ltd, based in Abingdon, Oxfordshire. The engine is uniquely designed to tap oxygen from the atmosphere in the early part of a space flight before switching to conventional rocket mode for the final ascent into orbit. 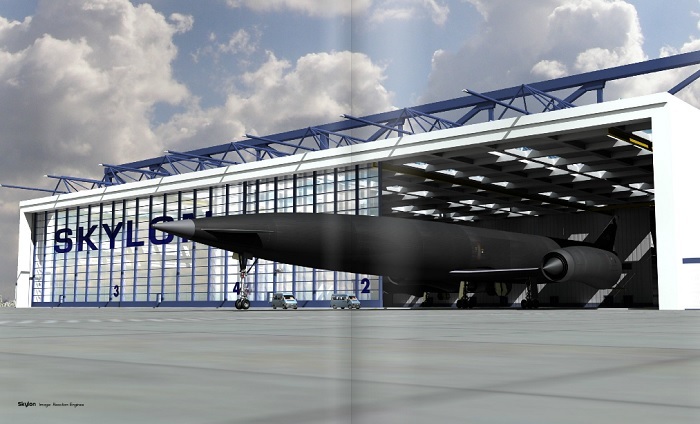 A concept re-usable space plane powered by Sabre, called Skylon (main picture), would enable the kind of routine access to space normally associated with sci-fi novels and movies. Taking off and landing like an ordinary aircraft, it would also be able to soar through the atmosphere at up to five times the speed of sound. The 10 million euro (£8 million) Esa payment is in addition to £50 million already invested by the Government through the UK Space Agency. It will facilitate the next step in developing Sabre that could see a demonstration engine begin test firing in about four years, said the European space organisation. 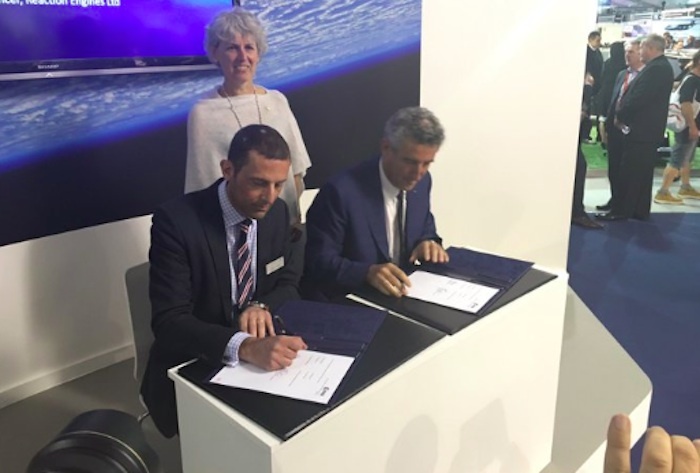 A contract paving the way for the Esa funding was signed by Franco Ongaro, the agency’s director of technical and quality management, and Reaction Engines chief executive Mark Thomas. Ongaro said: “Reaction Engines and Esa have been working together since 2008 to make the Sabre concept a reality. A ground demonstrator engine would take the vital step of bringing individual elements of the technology together for the first time. One of the biggest technological hurdles is rapidly chilling the hot airstream entering the engine at hypersonic speed. For the air to be usable by the engine, it has to be cooled from 1,000C to minus 150C in just a hundredth of a second, while avoiding the formation of potentially dangerous ice. In 2012, Esa oversaw testing of a pre-cooler designed to carry out this incredibly challenging operation. The engine is likely to be test fired at a new £4 million UK National Space Propulsion Facility to be built in Westcott, Buckinghamshire. News of the Government’s commitment to constructing the testing centre was announced earlier by the UK Space Agency. ESA’s involvement began in 2010 with an independent review of SABRE’s viability, opening the way to UK government investment. 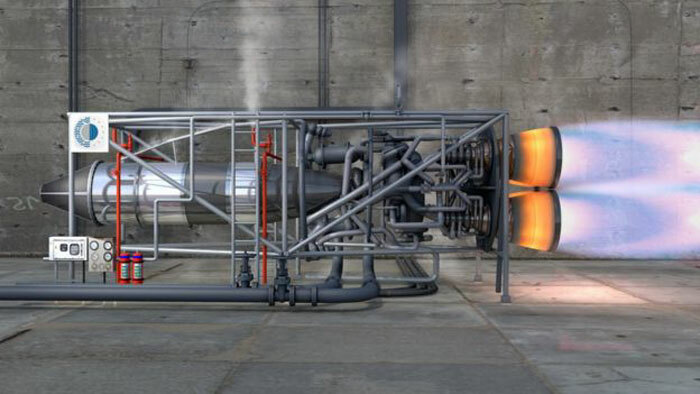 Then, in 2012, ESA collaborated with Reaction Engines on testing of an essential element of SABRE – the pre-cooler that cools the hot airstream entering the engine at hypersonic speed, the performance of which was fully validated under ambient air temperatures. Reaction Engines launched a significant new element of its development programme in October 2016 to design, build and demonstrate a SABRE engine core. The test item consists of an engine core, which is a key module of the complete SABRE engine, but without the pre-cooler and rocket nozzle in place. Following completion of this core design and development activity major elements of the world’s first air-breathing engine capable of accelerating from zero to Mach 5 will have been demonstrated. 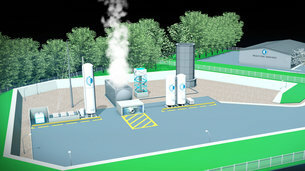 The complete air-breathing core demonstrator will be fully representative of the SABRE thermodynamic core cycle, fuelled by liquid hydrogen, and will contain heat exchangers plus combustion and turbomachinery modules.